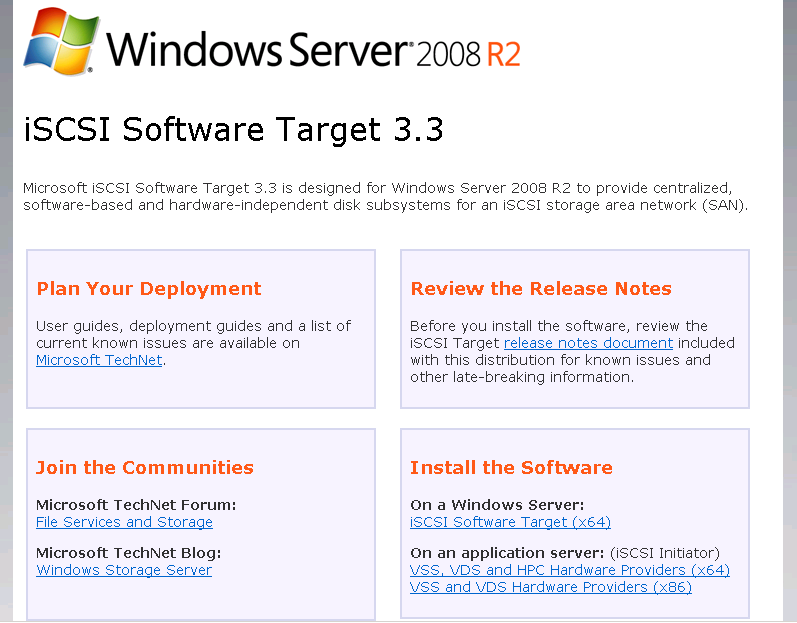 Microsoft released their iSCSI target software earlier this month for Windows Server 2008 R2. This used to be only for windows 2008 Storage Server. 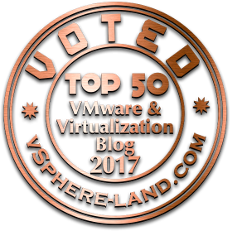 This is good news for those who wish to have a Windows 2008 Server host storage for ESX, or Hyper V. You won’t get the bells and whistle’s like you would with a EqualLogic or EMC SAN, and you won’t get the performance either; what you will get, is cheap, easy storage with a feature or two. Choose iSCSI Target Software (x64), and ‘Next’ your way through the installer. Now, when you open up Server Manager, you will see “Microsoft iSCSI Software Target” under Storage. iSCSI Targets are definitions of iSCSI initiators that are allowed to connect to this server. 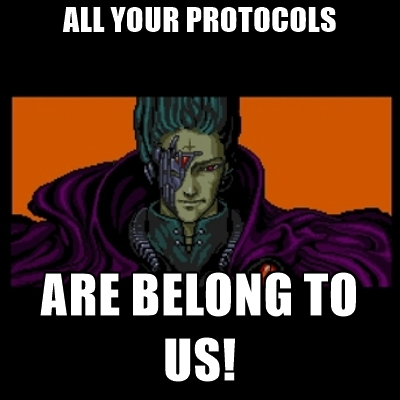 Devices are the Virtual Disks you assign to the Targets. Microsoft iSCSI Target Software uses .vhd files as the virtual disk files that are exported. In my test scenario, I have 2 ESX servers, and will only be using 1 LUN. Choose “Create iSCSI Target” in “iSCSI Targets”, and enter a unique name ( I chose ESX1). At the next screen, it prompts for the iqn of the ESX Server. 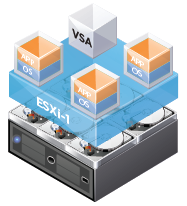 The advanced button also lets you choose other methods of identifying the ESX server. I chose advanced, and entered the IP of my ESX Servers iSCSI initiator. Click Finish. Repeat this for each initiator that will be connecting to your iSCSI storage. Next, we need to create a disk. Under “Devices”, right click and choose “Create Virtual Disk”. Choose the location to store the .vhd file, choose how large you want you new LUN to be, and a description. The last windows will allow you to choose what “targets” will have access to this new LUN. Overall, I think it’s a great product, and it’s free! I’m glad that Microsoft has included snapshots, and the ability to rollback to a snapshot, or mount a snapshot in the software. We are in process of building a windows server 2008 r2 with SP1 as a fileserver. 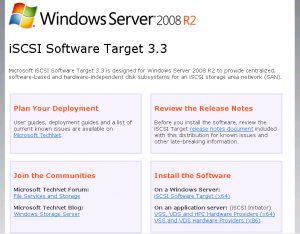 We would like to install the iSCSI target 3.3 on the same server. We like to enable volume shadow on the D:\ drive as this where ALL the file share going to be. 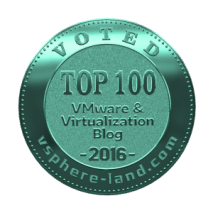 But we like store the iscsi VHD’s here as well. Will the Volume shadow on the D: drive cause any issue and is this recommended by MS? There won’t be any problems having it enabled on the drive holding your VHDs. However, you would not be able to mount them from the Shadow Copy – if you ever needed to. I could not find any information about it being recommended or not, but, it is supported. Nice article. I am however getting unsupported operating system. Is it because I am running MSFT Data Center 2008 R2 – 64bit? It is supported for all 2008 R2, Standard, Enterprise, and Datacenter. Perhaps a permission or configuration error? I was able to test and had no issues connecting esxi 5.1 to Microsoft’s iSCSI target. Yes, 3.3 is still the latest.